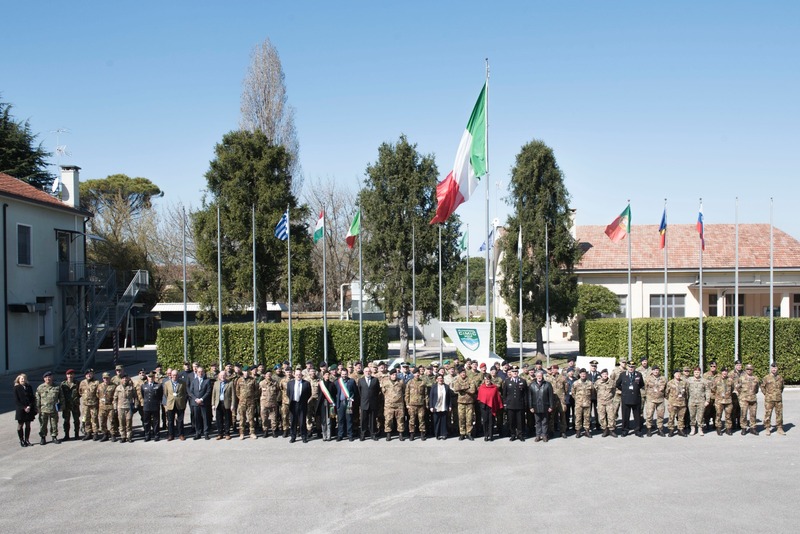 The Multinational CIMIC Group (MNCG), has conducted its biggest exercise since its establishment, namely exercise "DOUBLE RIVER 2019" (DORR 19) at "Mario Fiore" Barracks and in Motta di Livenza - Oderzo countryside, from 18 to 22 March 2019. Multinational CIMIC Group is a Combined /Joint Regiment, established in Italy in 2002 (originally named CIMIC Group South). It is the operational unit of Supreme Headquarters Allied Powers in Europe, located at Mons (Belgium), for the conduct of joint and combined operations in the sector of civil-military cooperation. Italy is the framework nation and other contributing nations include Greece, Hungary, Portugal, Romania and Slovenia. CIMIC operators from Multinational CIMIC Group are currently deployed to International Operations in Kosovo, Afghanistan, Lebanon, Somalia, Djibouti, the Mediterranean Sea (Operation "Sophia") and in the framework of domestic homeland security Operation "Strade Sicure". "DOUBLE RIVER 2019" is the major military exercise carried out by the Multinational CIMIC Group in 2019, putting together units, specialists, experts and mentors from NATO HQs, COEs, Allied Nations and NGOs. The purpose of the exercise was to test the skills of the MNCG and its subordinate CIMIC Units from Italy, Portugal and Hungary, appointed as NRF standby CIMIC units. Through a Command Post Exercise (CPX), a complex scenario reproduced a situation of crisis among fictitious states. The MNCG operated in strict compliance with the civil environment, responding to the growing challenges of hybrid threats. In addition to the computer simulation, the exercise also had a part on the field (LIVEX) where the CIMIC units interacted with the civilian counterparts represented by Governmental, Non-Governmental Organizations and local authorities. During the course of the exercise the Remote CIMIC Support (RCS) concept was exercised also . Already tested in past exercises, the RCS is the Reachback capability to remotely support the CIMIC units on the ground. Manned by a diverse team of subject matter experts (SMEs) from Bulgaria, Italy, Romania and Slovenia, provided expertise on cross-cutting topics (Cultural Property Protection and Children and Armed Conflicts) and on Resilience. Crisis Management and Disaster Response Centre of Excellence joined DORR19 with two experts, being members of the RCS, who delivered Centre′s expertise on Resilience. Dealing with the NATO agreed seven baseline requirements on Resilience on operational and tactical level from CIMIC point of view is a challenging and unexplored field which paves the road for future developments and improvements. CMDR COE experts collaborated on the development of infrastructure assessment reports to enable the CIMIC Units on the ground to monitor and assess the civil environment in the area of responsibility with a specific focus on Civil Preparedness and Resilience. On the 20th March the Distinguished Visitors and Media Day took place with the attendance of Minister Trenta, ITA MoD. "Today we know that we must interact with all the civilian actors engaged in conflicts, starting from local authorities and including International Organizations, governmental and non-governmental organizations as well as the media, in order to avail ourselves of the best possible level of knowledge, and for a constant assessment of the social and cultural environment where we are operating". In her speech, the Minister recalled the results achieved in the last few years in various theatres, including Kosovo, Lebanon, Somalia, Djibouti, Afghanistan, and also within the framework of European mission EUNAVFORMED. Looking to the future and to challenges that NATO - that this year is celebrating its 70th anniversary- will have to face, Minister Trenta said: "Tomorrow′s NATO will have to be able to operate over the full range of possible threats, whatever their nature and geographic origin".